December 6th is St. Nicholas Day. And to let you in on a secret, he is visiting the Nursery Classroom at Hazel's school tonight. The children will be surprised when they go inside tomorrow morning. They will also hear a little about St. Nicholas. Do you know about him? Saint Nicholas was born in the third century in Asia Minor, now Turkey, to a wealthy family. He was raised to be a devout Christian and lost his parents in an epidemic. There are many stories about his giving spirit and caring for the poor, the sick and the suffering. There are also many stories about how he cared for the children. For more information you should check out my source of this information, the St. Nicholas Center. In the classroom tomorrow the children will hear about a good boy named Nicholas who was given so much good food and toys that he would walk with his pockets full of them and when he saw someone suffering or poor he would give that person his things. He went on to become a Bishop when he grew up and heard about an entire town that was suffering from hunger. He had all of his servants gather food and sailed a ship with blue and white sails to the town and knocked on the doors of the people. No one saw him, but when they answered the door there would be food at it. There are also customs in some countries of leaving shoes out for your gifts. Apparently one of the times Nicholas threw the food in the windows it landed in a shoe and after that the shoe legend began. 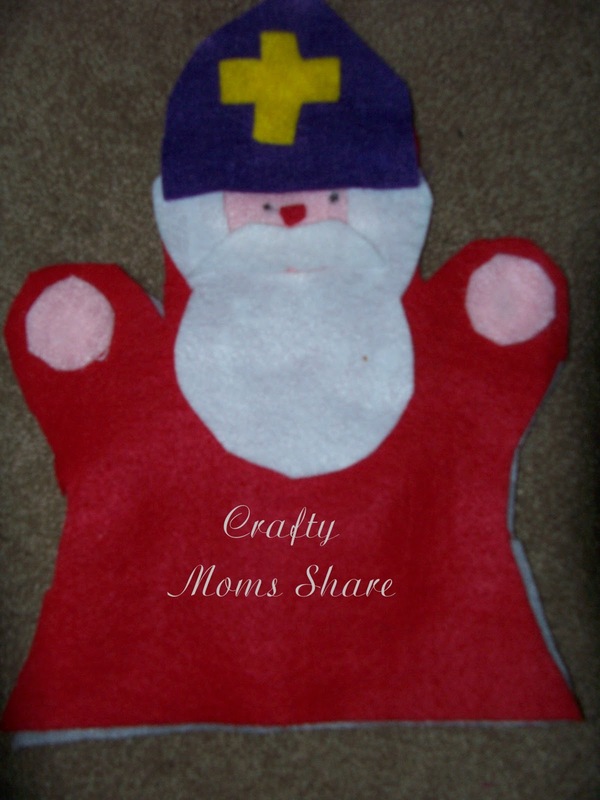 So not only will Hazel get some St. Nicholas celebration at school in the morning, but we also made the hand puppet pictured above using the pattern I found at St. Nicholas Center. We followed the directions and glued everything. Hazel will get to play with it tomorrow. I also made a felt ornament. I am going to give it to Hazel in the morning. I found the pattern at St. Nicholas Center as well. They also have stories, pictures, printables, find hidden object game and other crafts. In the morning we will rush to school, but after school we will have some time to explore St. Nicholas a bit more. I printed the hidden object game (one of Hazel's favorite things to do nowadays) and pages to color as well as some of the paper crafts for us to try. We also found this book at the used book store, so we will be reading it tomorrow again. The book, The Gift from Saint Nicholas by Dorothea Lachner is a wonderful story about how children making a wish to St. Nicholas and he comes through with giving everyone what they wished even though it had been snowing for days and no one could leave their homes. 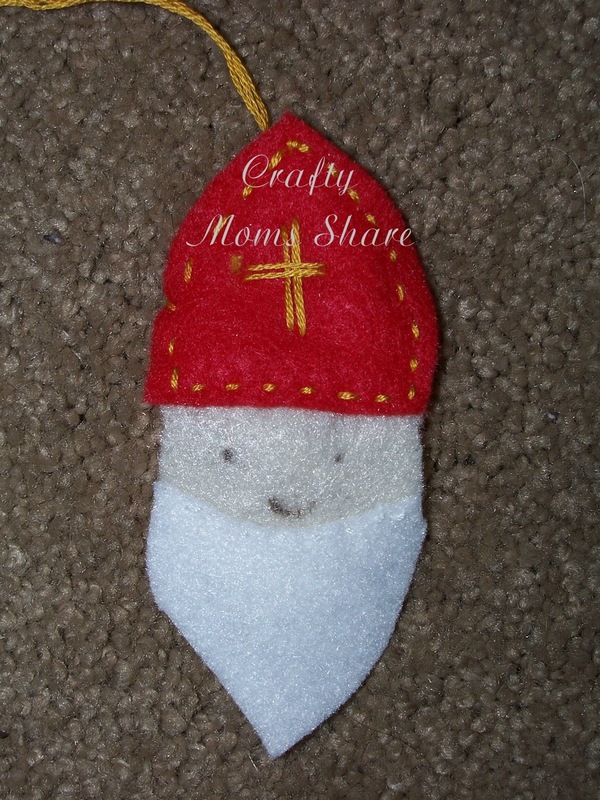 Now why do I love celebrating St. Nicholas? Well I love the fact that it changes Santa Claus to someone who believed in Jesus and followed God. I love that it takes the importance of what you receive away and makes it more important that you are a giving person. I feel that it reminds us of the true spirit of the holiday. How will you be celebrating St. Nicholas Day? Nice and INCREDIBLE THINKING!! I respect Saint Nicholas. Thanks for sharing. 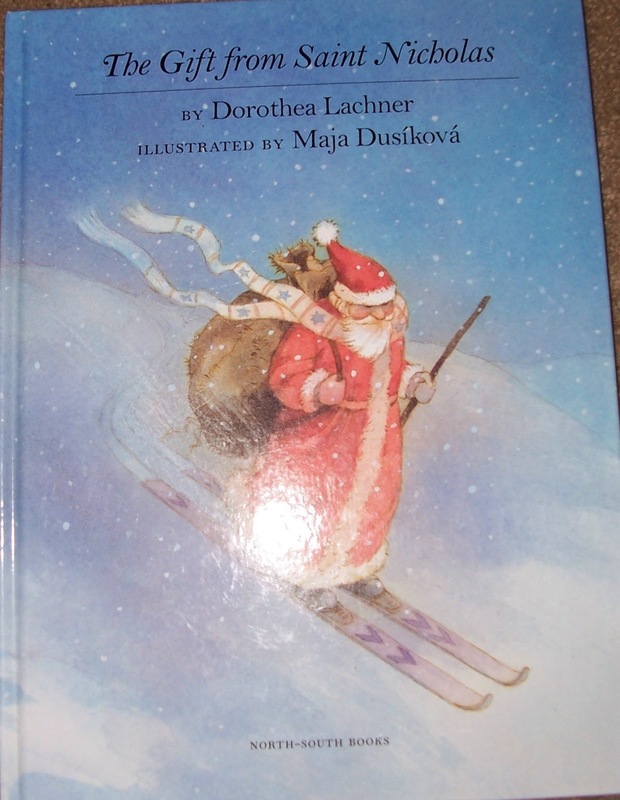 Yay-- another new St. Nicholas book to add to my collection! I love all the ideas here. Thank you so much for linking up to Waldorf Wednesday. I hope we'll see you back this week!